After much preparation, Who is Hussain Nairobi is primed to kick-off the new year by launching its long awaited project “ Shoes that grow”. This endeavor is being carried out in collaboration with Ahadi Kenya trust that has been running an anti-jigger campaign in East Africa. Jigger infestation is a major problem in many low-income areas due to poor hygiene and poverty. This leads to symptoms of itching, irritation, inflammation and ulceration in the early stages. If untreated, the problem progresses to cause tetanus, gangrene and even loss of a toe. Improving hygiene conditions and wearing of shoes are some of the many ways to prevent jigger infestation. Children in these areas outgrow their shoes quickly and the economic conditions do not allow them to buy increasing sizes of shoes. Hence they usually commute bare-feet which further exposes them to the problem. Furthermore, once affected, these children usually drop out of school jeopardizing their future. 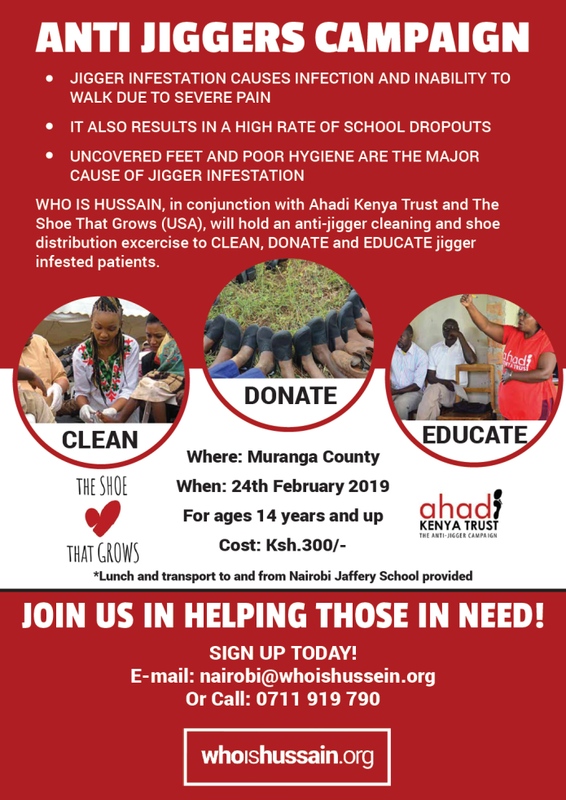 Therefore, Who is Hussain Nairobi in conjunction with Ahadi Trust Kenya are holding “An Anti-jiggers Campaign” at the Muranga County on Sunday the 24thof February 2018 from 8am to 6pm. We are planning to treat 100 affected children and provide them with awareness and prevention strategies. Following this, they will each be given a pair of “Shoes that Grow” which will sustain them for at least the next five years and grow with their feet. Furthermore, The affected children and their family members will be provided with meals and other donated shoes. Registration is open to anyone 14 years and above interested in participating in this campaign at a minimal fee of Ksh 300 to cover the lunch cost. Lunch will be provided however they are free to bring snacks if they wish to. Please also take note of the registration deadline, which is 18th February 2018. Disclaimer: Advertisements published via the SAAJ Mailing List in no way constitute an endorsement of a product or service by SAAJ.